Collector’s note: For most collectors of any team, tickets usually are a central part of their collection. 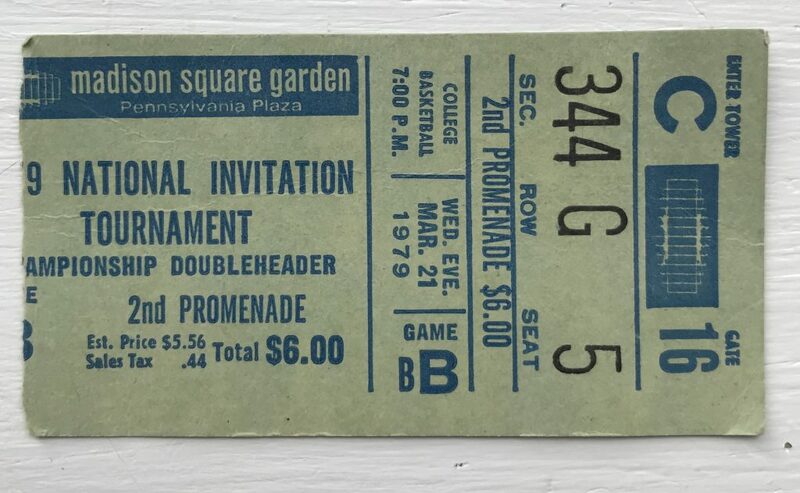 Ideally, collectors look to gather tickets from significant games and milestones. For Indiana collectors, this would include stubs from Indiana’s NCAA titles, Calbert Cheaney’s Big Ten scoring record game, etc. One may overlook an NIT title ticket for a collection, but it belongs just the same. My father was a student at Indiana University from 1972-1976 and was lucky enough to witness the greatest four-year period in IU basketball history. Those four teams would accomplish an NCAA title in 1976, a Final Four appearance in 1973, four straight Big Ten championships, and an overall record of 108-11. When the conclusion of the 1975-76 season came and went, many Hoosier faithful expected a period of rebuilding. This was evident with the 16-11 overall record of the 1976-77 team. The 1977-78 squad, led by seniors Jim Wisman and Wayne Radford, improved to a 21-8 record. Still, many questions remained with a talented but young squad that would be the face of Indiana basketball for the 1978-79 season. Bob Knight’s 1978-79 squad was a mixed bag, and with that came uncertainty about expectations. The only experienced starters to return were junior Mike Woodson (who Knight would name captain), a native of Indianapolis, and Anderson native sophomore Ray Tolbert. Junior Butch Carter, sophomore Steve Risley, and freshmen Randy Wittman and Landon Turner were expected to be key contributors as well. Indiana was given a preseason AP ranking of 10th despite the question marks. 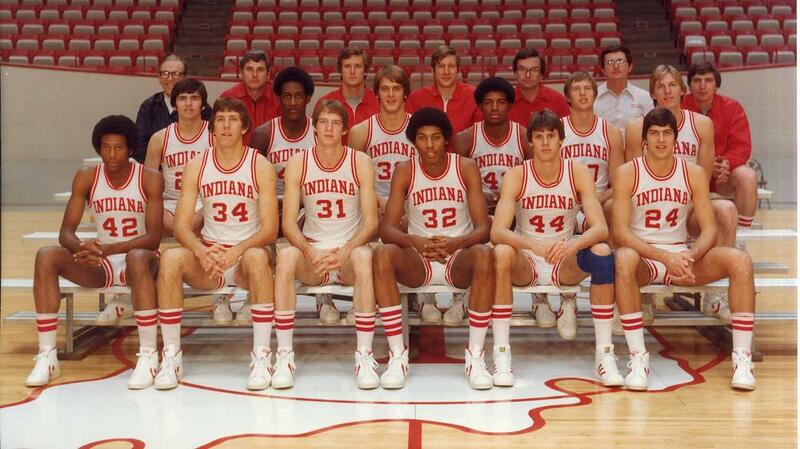 The Hoosiers of 1978-79. Photo: courtesy of Indiana University Archives. Indiana’s season did not get off to a pleasant start as the Soviet Union National Team came to Bloomington in exhibition play on November 11th and whipped the Hoosiers 68-55. The Hoosiers would shoot a dismal 33% from the field and have major issues with the height of the Soviet team (three starters averaged 6’10”, 7’0″, and 7’4″). Coach Bob Knight called it the most talented Soviet team he had seen in several years, but also admitted that the game plan was not followed well, as the Hoosiers rushed shots and were out of tempo. Participation in the Sea Wolf Classic in Alaska would kick off the regular season for Indiana. The distant trip would prove disastrous in more ways than one. Indiana would drop its first two games of the tournament to Pepperdine and Texas A&M, before finally getting its first win of the season against Penn State in the 7th place game, 86-65. Returning to the friendly confines of Assembly Hall, the Hoosiers would win their home opener against Morehead State, 80-37. Junior Ray Tolbert would lead the Hoosiers with 20 points while sophomore Tommy Baker would add 14 points in the victory. Indiana’s win streak would stall at two when IU was dealt another loss (their third in five games) by the Georgetown Hoyas in Landover, Maryland, 60-54. Mike Woodson, Ray Tolbert, and Steve Risley would all foul out as the Hoyas went 23-32 from the foul line compared to Indiana’s 2-6. Bradley University came to Bloomington on December 9th and the Hoosiers were able to bounce back with an 80-64 victory behind 26 points and 10 rebounds from Steve Risley. But the gratification of a solid victory would be short-term for Bob Knight and his team. In the days following the Bradley victory, Knight became aware that eight of his players had smoked marijuana while on the Alaska trip. Three players would subsequently be dismissed from the team: senior Jim Roberson (a member of Indiana’s undefeated NCAA title team in 1976), Tommy Baker, and Don Cox. Additionally, Knight placed five players on immediate probation: Mike Woodson, Ray Tolbert, Eric Kirchner, Phil Isenbarger, and Landon Turner. Despite the obvious distraction to the program, Indiana pulled an upset victory over rival Kentucky 68-67 on December 16th. Four consecutive victories followed, over the likes of Davidson and Washington (Indiana Classic) and Washington and Oregon (Far West Classic). Indiana would drop the title game of the Far West Classic to a Big Ten foe in Michigan State (the eventual NCAA champion), 74-57. Indiana would close pre-conference play with an 8-4 record. Indiana’s Ray Tolbert battles for a rebound during the Ohio State game, February 3, 1979. Photo: courtesy of Indiana University Archives. 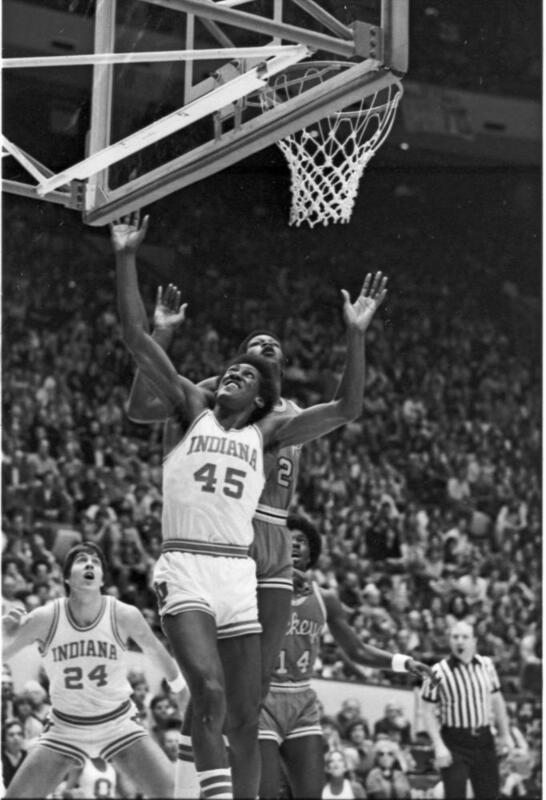 Big Ten play officially began for Indiana when 4th-ranked Illinois came to Bloomington on January 4th, 1979. The undefeated Illini proved too much for the Hoosiers, winning 65-61 and outscoring Indiana 10-2 in the final minutes of the game. Ray Tolbert would lead Indiana with 18 points. Over the course of their next four games, Indiana would struggle, going 1-3 including road losses to Minnesota, Iowa, and Michigan State. Indiana would lose the three road contests by an average of 23 points. The lone victory came against in-state rival Purdue on January 6, 63-54. Four of Indiana’s next six games would be played in Assembly Hall, and Hoosiers fans hoped the longer home stand would right the ship of their rocky season. Mike Woodson’s 28-point performance would lift him to 6th on Indiana’s all-time scoring list following the 74-45 win over Northwestern on January 20th. A win against Wisconsin would follow five days later. Indiana would let a key road win against a top conference foe slip through their fingers as the Hoosiers would lose an OT heartbreaker to Ohio State, 66-63 on January 27th. The loss would drop the Hoosiers to 3-5 in Big Ten play. A victory over Michigan, which included 21 points from freshman Landon Turner, would be the first of three straight victories (the latter two over Ohio State and Northwestern). Post-game comments from Bob Knight, especially in the Michigan win, showed his praise for the young team, but also continuous frustration with turnovers (28 in the Michigan game) and how his teams would build large leads, only to fade toward the end of games. Indiana stood 6-5 in conference play (14-9 overall) with seven games remaining. Two straight losses against Michigan and Michigan State would be followed with three straight victories against Wisconsin (68-62), 12th-ranked Iowa (64-62), and Minnesota (71-46). Indiana would travel to West Lafayette for a battle against Purdue, and a possible NCAA Tournament berth on the line. The Hoosiers did not help themselves at all, shooting a cold 33% from the field, including going ten minutes without a field goal in the second half. Purdue would go on to win 55-48. Mike Woodson would lead the Hoosiers with 20 points and freshman Randy Wittman would add 15. The season finale would take Indiana to Champaign to face an Illinois squad that had defeated the Hoosiers to start the Big Ten season. It would be the “Mike Woodson Show”, as Indiana defeated the Fighting Illini 72-60 behind 48 points from the junior Woodson (29 in the first half). Woodson’s scoring performance was the most from an Indiana Hoosier since Scott May’s 41-point performance against Wisconsin in 1976. 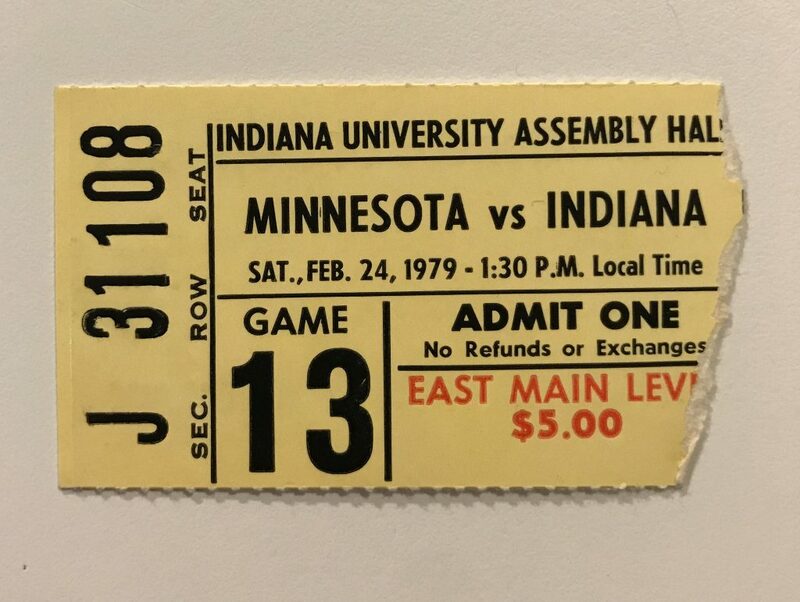 A ticket stub from the 1979 Indiana-Minnesota game in Bloomington. The Hoosiers would finish the regular season 18-12 overall (10-8 in conference), good enough for a berth in the National Invitation Tournament and a first round match up against Texas Tech in Lubbock. IU would take care of an over-confident Red Raider squad, leading 15-2 early, and ending with a 78-59 victory behind 30 points from Mike Woodson. The victory would give Indiana the opportunity to host Alcorn State in the second round. Fans in Assembly Hall were not expecting Alcorn State to give Indiana a run for their money, but with only :08 seconds remaining in the game, Indiana only led by two points. Two free throws by freshman Randy Wittman would seal a 73-69 win and send the Hoosiers to Madison Square Garden for the NIT finals. A familiar foe in Ohio State would be the Hoosiers’ semi-final opponent. Implementing a stingy zone defense, IU took care of business to win 65-55. This meant an all-Big Ten final as the Hoosiers and Boilermakers would meet for the third time in the season on March 21st. Purdue had blown out Alabama in their semi-final match up behind 42 points from Joe Barry Carroll. Shutting down Purdue’s Carroll was key for coach Bob Knight’s game plan, just as shutting down Indiana star Mike Woodson would be the goal of Purdue. The Boilermakers held a tight four point lead at half. A back and forth battle lead to a 52-51 Purdue lead with 4:30 remaining. Knight instituted a rarely used tactic by Indiana and had his team stall by routinely passing the ball for the next three-plus minutes. A pass down low to IU center Ray Tolbert was stolen by Purdue with just over a minute remaining, leading to a desperation foul against Purdue center Joe Barry Carroll. Carroll would miss the front end of a 1-1 free throw opportunity, giving Indiana the ball down one point with a chance to win the game. Knight exhausted Indiana’s remaining three timeouts in an attempt to confuse the Purdue defensive strategy. Mike Woodson would be the go-to for Indiana’s last shot option, but was heavily guarded, leaving Indiana’s Butch Carter with a 20-foot jump shot at the top of the key which fell through the hoop, giving Indiana a one-point edge. A late shot attempt by Purdue would not fall and Indiana would be crowned NIT Champions. Landon Turner would lead Indiana with 13 points, followed by 12 a piece from Butch Carter and Ray Tolbert. 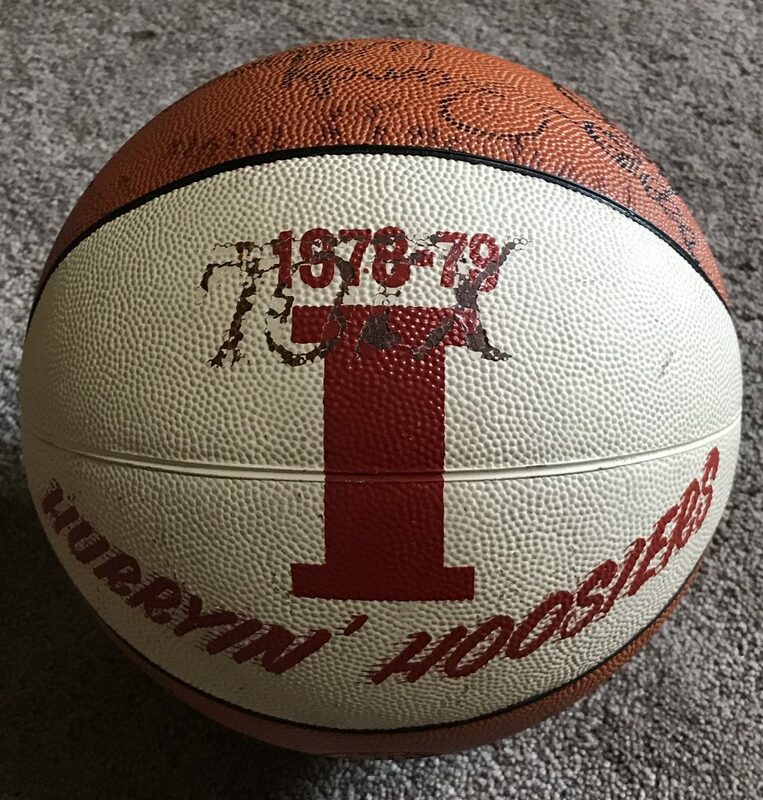 A team signed basketball of the 1978-79 NIT Championship Indiana Hoosiers. The conclusion to the 1978-79 season was one that many would not have expected considering the trials and tribulations that occurred during the year. Despite the setbacks of tough losses and off-court issues, Indiana would return to Bloomington with championship hardware. Additionally, a young but talented squad would only get better with time.